If you’ve spent any time whatsoever at the App Store, then you know that ball-rolling games are huge on the iPhone. Apparently it’s one of the first impulses a game developer has when s/he hears the word “accelerometer”, and I don’t blame ’em. The two go together like wine and cheese, and they come in a wide variety, everything from Labyrinth to Super Monkey Ball. Mad O Ball is a bit more on the Super Monkey Ball side of things, but without the zaniness, just a ball and a narrow track. There are 32 levels in 4 different worlds, and your goal is to get the ball from one end to another, all while racing against the clock, and you will have to negotiate sharp turns, curves, ramps, and jumps. 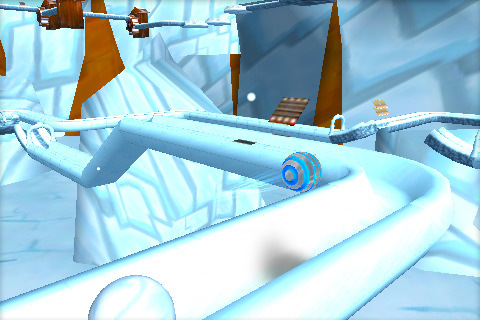 The controls are simple: tilt the device to roll in a particular direction and tap the bottom corners to jump. There are also a few checkpoints scattered throughout so you don’t have to start from scratch if you should fall. Although the controls are quite sensitive and responsive, the game is actually pretty difficult. There are occasional warnings for upcoming obstacles or turns, but even with the heads up, the track is fairly brutal and unforgiving. It’s trivially easy to lose control and go flying off the edge, which can lead to a ton of frustration. Calibration issues contribute somewhat to this, as it’s extremely difficult to play on anything but a flat surface. This makes the game a little harder to evaluate, because while it handles very well under those circumstances, for some, that won’t be the preferred position, and it’s just about impossible to play while on the move. Although the graphics are a bit on the simple side, I found them to be attractively clean, although the menus looked oddly dull by comparison. The soundtrack is catchy, but it really started to irritate me after awhile, so thankfully, there is also an option to play your own music. The game is also OpenFeint enabled, so there’s plenty of online incentive in place to keep you playing. If you’re a fan of ball-rolling games, this is a remarkably polished title, but it will definitely frustrate casual players. Mad O Ball doesn’t really bring any innovation to the genre, but gameplay is varied and there is a ton of content. The rather high price tag of $3.99 may put some people off, but there is a free Lite version available to try out. If you want to give your accelerometer a decent workout, Mad O Ball is definitely worth a look. AppSafari review of Mad O Ball was written by Tracy Yonemoto on May 11th, 2010 and categorized under Action, App Store, Free, Games, Physics Based, Racing. Page viewed 4040 times, 3 so far today. Need help on using these apps? Please read the Help Page.